This Is Mike Stud TV show image via Esquire Network. 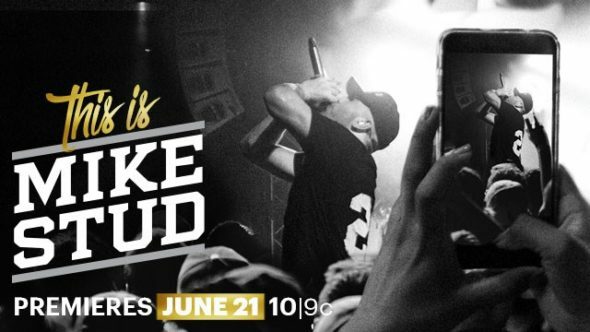 Watch the commercial-free early premiere of Esquire Network‘s new This Is Mike Stud TV show, today. The series officially debuts on Esquire Network, Tuesday, June 21, 2016 at 10:00pm ET/PT. The show was announced under the working title, The Mike Stud Project. The docu-series follows hip-hop artist Mike Stud, a former All-American baseball player. Stud turned to music, after a career-ending injury took a future in pro ball off the table. The This Is Mike Stud TV series cast includes: Mike Stud, Matt “Blue” Ouellet, John Kilmer, DJ Fader, Gerry Corcoran, and Patrick “Paddy” Quinn. This Is Mike Stud is produced by Den of Thieves. Jesse Ignjatovic, Evan Prager, and Alexandra Lipsitz executive produce. The series is co-executive produced by Jordan Barrow, Jared Morell and Austin Rosen. Watch the This is Mike Stud TV series premiere at TV.Esquire.com. Get more information, from this Esquire press release. FULL EPISODE SNEAK-PEEK OF ESQUIRE NETWORK’S “THIS IS MIKE STUD” AVAILABLE NOW, STREAMING COMMERCIAL FREE! Esquire Network’s “This Is Mike Stud” premiere episode is now available in its entirety on Esquire TV Now commercial free! The episode will also be available on desktop and mobile via EsquireTV.com, on iOS devices with the Esquire TV Now app, as well as on video-on-demand on set-top box. “This Is Mike Stud,” a new eight-episode docu-series premiering Tuesday, June 21 at 10 PM ET/PT on Esquire Network, will go behind the scenes, into the chaotic life of Mike Stud, a Duke educated, former All-American baseball player who unexpectedly turned to music after an injury robbed him of his lifelong dream to play pro ball. Viewers will come along for the wild ride during Mike’s nation-wide Back2You tour as he and his loyal pack of lifelong friends navigate life on the road all while holding it together in the mercilessly harsh yet wildly exhilarating journey to becoming a superstar. What’s most impressive of all, Mike has done it entirely independently— no labels, just him and the variously talented ‘cast of characters’ that live with him, work with him, and ultimately rely on him for their livelihood. Tune-in to the series premiere of “This Is Mike Stud” on Tues., June 21 at 10 PM ET/PT on Esquire Network. How do you like the sound of the This Is Mike Stud TV series? Watch the premiere episode and tell us what you think. More about: Esquire Network TV shows: canceled or renewed, The Mike Stud Project, The Mike Stud Project: canceled or renewed?, This Is Mike Stud, This Is Mike Stud: canceled or renewed?